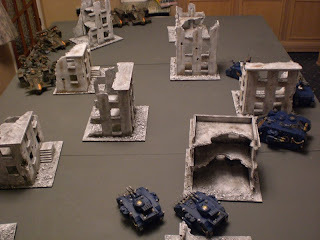 This week's 40K battle report has more photos. 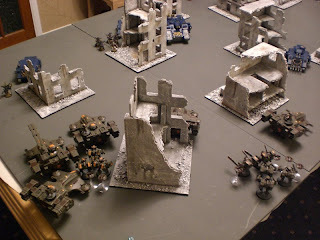 In fact, this 40K battle report is a little bit different. Namely because Simon borrowed my Warhammer Tau army to take on James's Thousand Sons. 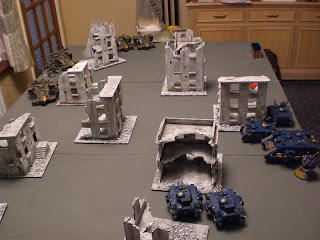 The reason this 40K battle report is so different, is not only because I'm not playing, but most importantly because my Warhammer Tau tournament list has been put into the hands of a casual, once-in-a-blue-moon player. James's Thousand Sons army is by no means overpowered. But in this 40K battle report I wanted to see if a novice with a strong list, which they don't know how to play can beat a run of the mill army. James won the roll to go first, picking a bottom right table quarter with the most buildings and deployed his entire force. 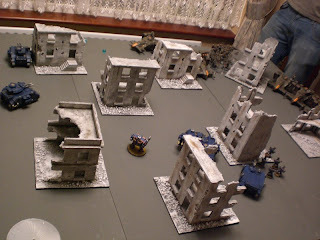 The 2 Chaos Predators were on the left of his deployment, hidden behind a building. The Chaos Land Raider was in the centre, alongside the Chaos Dreadnought while the two Rhino transports, carrying the Thousand Sons and the Chaos Lord were deployed further north from the Land Raider. All tanks were concealed behind buildings. Simon proceeded to set up his entire army in the top left corner, mimicking James's set up. THe Hammerhead and 2 Devilfish took position right at the top, behind a building. Further down on the left was the Skyray and Broadsides and further down from them was the 2 Tau Battlesuit teams, concealed behind a Devilfish and a building. James took the first turn, advancing the Thousand Son Rhinos North, behind cover. The Land Raider and Chaos Dreadnought moved down the centre while the Chaos Predators moved around to the left, firing at the Devilfish concealing the Tau Battlesuits, but failed to harm it. Similarly, the Land Raider and Chaos Dreadnought fired at the Tau Skyray, but both shots were deflected by the disruption pod. Simon moved nothing, stating that he wouldn't sacrifice his defensive position. Then found that most of his guns were out of range. But that didn't stop the Broadsides from immobilising the closest of the two Thousand Sons Rhino transports. James disembarks his Thousand Sons out of the immobilised Rhino. The other Thousand Sons Rhino, carrying the Chaos Lord continues its advance Northwards and fires its smoke launchers. Meanwhile the Chaos Dreadnought goes into a FIRE FRENZY and takes aim at the advancing Chaos Land Raider. Both shots hit, but fortunately fail to penetrate. The Land Raider shoots at the skyray again. Does nothing. 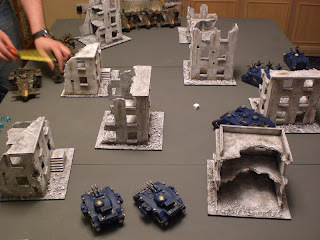 The 2 Chaos Predators continue sweeping around the left flank, firing their twin linked lascannons at the Devilfish which the Tau Battlesuits are hiding behind and manage to blow off the smart missile system. Simon advances the Hammerhead flanked by 2 Devilfish to fire at the disembarked Thousand Sons squad. Unfortunately, he's far too cautious and it just inches out of weapons range. But a submunition round the from Hammerhead's railgun does manage to kill a single Thousand Son. The Tau Devilfish on the bottom left of Simon's deployment zone moves aside, making room for the 2 squads of Tau Battlesuits who target the nearest Chaos Predator with their missile pods, but either miss or harmlessly bounce off the armour. He needs 6's to glance you see. Afterwards they jump back behind the Devilfish again. Meanwhile the Skyray targets the advancing Chaos Land Raider, locking on with one markerlight, which is then used to boost the Ballistic Skill of the Tau Broadside team by +1. Both railgun slugs slam into the Land Raider. One fails, the other glances and a twin linked lascannon sponson is destroyed. The Chaos Land Raider and Dreadnought advanced together, firing at the Skyray with no effect. Either by failing to penetrate or the Skyray's disruption pods deflecting the incoming shots. The Thousand Sons behind the Rhino moved into of the nearby building, firing a Bolt of Change at the nearest Tau Devilfish, shaking the crew who could not move or shoot this turn. 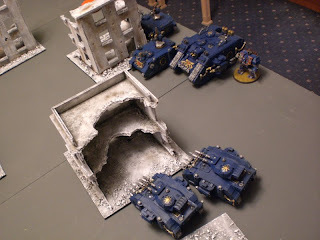 Meanwhile the Thousand Sons Rhino ferrying the Chaos Lord proceeded Northwards at full speed, behind another building. The sorcerer leans out of the top hatch and fires a Bolt of Change, but misses. The Chaos Predators advance along the left flank. One takes cover behind a building, while the other continues to fire at the Devilfish, glancing the tank and stunning the crew so that they may not shoot this turn. Simon moves nothing (again!) but drops the Tau Battlesuit teams back a bit to get the Thousand Sons squad in the building into line of sight. The Skyray splits its fire, aiming a markerlight at the Chaos Dreadnought and another at the Chaos Land Raider. Only the markerlight on the Chaos Land Raider hits, which is used by the Tau Broadsides to boost their Ballistic Skill. Both railguns hit, penetrate and the Land Raider is destroyed, but does not explode. The Hammerhead and two flanking Devilfish open fire on the Thousand Sons squads in the building, as do the Tau Battlesuit teams, killing 2 Thousand Sons with their combined firepower. 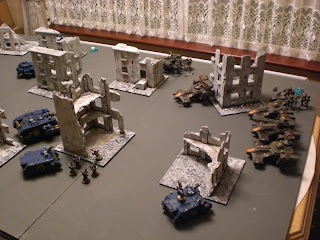 The Tau Battlesuit command team jump away to the North, behind a building while the Tua Battlesuit team with twin linked flamers and missile pods jump back behind the Devilfish which has just been stunned by the Chaos Predator. "Where's My Wife!!?" screams the Chaos Dreadnought and sprints forward 12" towards the Tau Skyray! And fired its smoke launchers of course. The Chos Predators continue their advance up the left flank, firing their twin lascannon turrets at the Devilfish concealing the Tua Battlesuit flamer team and still do nothing! The sorcerer of the Thousand Sons squad in the building fires a Bolt of Change at the nearest Devilfish, but the psychic blast is deflected by the disruption pod. The Thousand Sons Rhino with the Chaos Lord in continues to advance around the building while the sorcerer makes another Bolt of Change attack out of the top hatch, which shakes the nearby Devilfish, preventing it from moving or shooting. The Tau Skyray moves within 18" of the Thousand Sons and targets the Chaos Dreadnought with its markerlights. Both shots miss while the burst cannons open fire on the Thousand Sons squad in the building, combining with a barrage of firepower from the Tau Battlesuit teams, but between them they only manage to kill 2 Thousand Sons. The Tau Broadsides target the Chaos Dreadnought. One fails to hit, while the other causes a glancing hit, but fails to do anything due to the Dreadnought's extra armour. Meanwhile the Hammerhead and fully functional Devilfish open fire at the approaching Thousand Sons Rhino. The smart missiles and burst cannons do nothing. But a solid slug from the railgun flies straight through the obscuring building and into the side of the Rhino, penetrating the tank and immobilising it. The Chaos Dreadnought, obviously still mad with rage, rolls BLOOD FRENZY again and rampages forward, charging the Tau Skyray, hitting the skimmer twice, ripping off the engine blocks and the burst cannons, leaving the Tau skimmer immobilised. The Chaos Lord and Thousand Sons disembarked from their immobilised Rhino transport. The Lord fired his plasma pistol at the nearby Devilfish, to no effect, while the sorcerer called upon the powers of the warp, rolling a double 6, failing his invulnerable save and exploding in a shower of gore. Yikes! The Chaos Predators continued their advance up the left flank (it's a long way! ), firing on the Devilfish as they go. They managed to penetrate and immobilise the tank this time. Simon moves the Hammerhead and 2 Devilfish into position to gun down the Thousand Son squad led by the Chaos Lord, wiping them out until only the Chaos Lord remains. Meanwhile the Tau Skyray targets the Chaos Dreadnought in front of it with its marker lights, scoring a single hit. 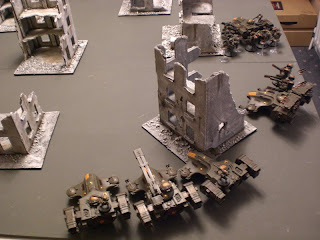 The Tau Battlesuit command team fire at the Chaos Dreadnought but cannot glance its armour. The Tau Broadsides use the markerlight on the Chaos Dreadnought to boost their Ballistic Skill again, scoring 2 penetrating hits. The Chaos Dreadnought explodes, sending scrap metal in all directions. Finally, the Tau Battlesuit team with twin linked flamers and missile pods glance a closeing Chaos Predator, ripping the twin lascannon turret from its mountings. We roll for another turn and the game ends. It's interesting to see how in the latter stages of the game Simon began to employ my commonly used tactics with various units and pulled through after an atrocious deployment and poor target selection. It goes to show that even by refusing to move most of his army, Simon could pull a win against this opponent with sheer firepower and lots of armour 12 vehicles. When questioned why he never advanced, Simon said that he guessed the distance for the Thousand Sons to get up the table would be too great and he could sit in relative comfort for 5 turns. That's something I've certainly overlooked myself and will be taking advantage of next time I play a game like this. It has to be said that James is still fielding his 4th edition Thousand Sons army and it needs some updating. Obliterators, Terminators, a Daemon Prince and a Defiler are on his shopping list, so it would be interesting to play him again. Aye...the Chaos player's list could've used some tweaking. Las/bolter preds really suffer when they can move and fire only one weapon. I think if he's going to keep the Preds, probably go for heavy bolter/autocannon/havoc launcher and be a dedicated infantry hunter. Otherwise, defilers and Oblits are better choices for heavy weapons. The Tau list...as you said, he played awfully conservative, but the Chaos List was pretty short-ranged. On the advance, he can get two, three anti-tank shots off, and with few shots and the ever-present 4+ saves he's not in a good way for killing vehicles. He did, though, have the ability to sit back 'n' shoot like whoa. If he popped the Rhinos faster, there's no real way for the K-sons to threaten the battlesuits (...which is about all they CAN engage in that army). He pops them, takes care of the lascannons, and he's good.